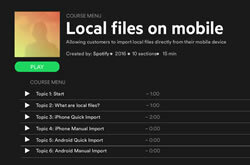 Training and templates to help arm the Spotify instructional design team. Spotify enlisted Principled Technologies to help arm its growing instructional design team. PT delivered a custom, on-site workshop that taught adult learning skills, instructional design best practices, Storyline development, and agile project management. PT also created 40 aesthetically-pleasing templates to help the team quickly produce future courses.